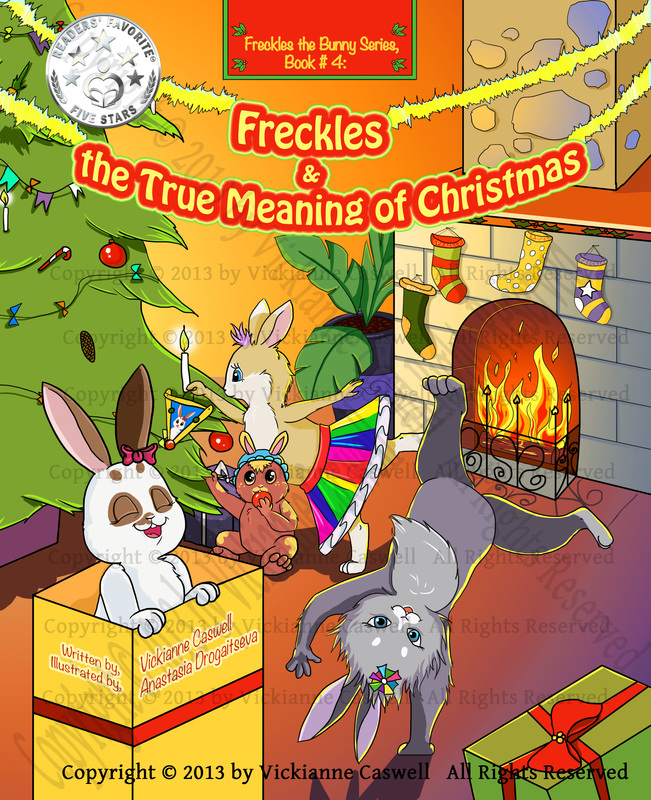 Review of "Freckles and the True Meaning of Christmas"
Freckles and her friends believe that Christmas is all about presents until their families decide to show them the true meaning of Christmas. Each family embarks on a magical Christmas journey, when they show their children that Christmas is about the love we have for each other. For the first time ever, meet the full family of Freckles the bunny (star and lesson learner of the books), Donut the duckling (who loves circles), Norma the fawn (who can run fast and is shy), Dreamy the chick (who loves to nap), Boots the kitten (who loves to groom) and Tiger the puppy (who loves to growl and pounce like a tiger). Characters are based on the author's real pets, with the same unique personalities. * Donate or volunteer time. SOFTCOVER: 53 pages (35 illustrated pages plus 7-8 extra bonus). 8 x 10" size. Ages 6+. "Love the new book, best one yet!!! Good job! The kids absolutely love the new book, love the format, larger size and the wonderful extras at the back, awesome job!!!" Freckles and The True Meaning of Christmas is a timely reminder that it is the giving not the receiving that is important before, on Christmas day and after. Without giving too much away, in this delightful Christmas tale we are invited to meet not just the brothers and sisters of Freckle’s friends but their entire families as they extend love and Christmas cheer, spreading good and helping around their community. Each family member gets involved one way or another to find the true spirit of giving their time and effort to those more in need. Vickianne has found a truly inspirational way to write a story to thank those amoungst us in the community who volunteer their time as well as to subtly suggest to others the significance of giving and sharing such a valuable commodity as spending time helping others. The pictures that accompany this story are absolutely adorable, clearly a great deal of time and effort went into designing them so that they would enhance the story in the best possible way. The fonts at time were a bit difficult to read, they are a little small and not quite bold enough to be ove-rtop their backgrounds quite the way that they are. That might make reading even more difficult if it is a child who is attempting to read the book themselves, larger print text is often times better for small children. What a wonderful idea, to have Freckles volunteer at a community center and really have to do something to help out others during the Christmas season. I think that the author, in having her main character do something like this, might inspire kids who read this story to see if they and their families could do the same. As Freckles learns by actually having to do something hands on, it isn’t the act of donating the goods/food that really matters, but getting involved herself. The fact that Freckle’s parents got the other parents involved, and Freckle’s friends too, really gave all kinds of options as to what even young people could do to get involved with charity and giving back to their communities. I think it made the story even more special that all of the kids ended up doing something to help out others and show that they understood the true meaning of Christmas. One of the most inspiring moments was the visit to Mr. Loppy and the way that Mrs. Lop asked if he needed some help with anything around his house. I think sometimes it’s easy to forget the people who live alone and I think that the author did a great job in reminding the readers about those folks too, and that they don’t just have to go to a facility to help strangers, that they can spread the spirit of Christmas by helping the people they know or see every day. The animal shelter was another wonderful touch, and something else that is often forgotten. Bravo to the author for having Boots’ family go there and help out. This is a reminder to children off the importance of nature and animals and that they too need aid, just like people. I think it would also give a family the opportunity to talk about the reasons many of these animals might not have homes and what can be done to prevent more animals from ending up in shelters. Shoveling was another great way of helping out, and these images, they have such rich depth of colors and such small details, like the frog in the hair of one character, and in this scene, with the shoveling, the dripping snow and the scarf sticking out from the snow. This whole story has just been very well thought out and I think children of several different ages can find things in the story to understand and appreciate. I thought it was a very interesting choice for the author to choose to have deliveries going to one of their classmates, it made it more personal to the character of Norma who was helping with the deliveries. The only suggestion for change that I have would be to show a scene with the kids on the stage having their Christmas concert and show the people they had visited and helped in the crowd, having come to watch them, I think that would really pull everything together, because right now it seems like there is a jump between everything that the families did to help, and Christmas morning. Just that one panel with them in the audience would tie it all together I think. I loved the added pieces at the end of the book, the goodbye poem and the family tree to show how everyone was related, I think the author really took into consideration things that would interest children.